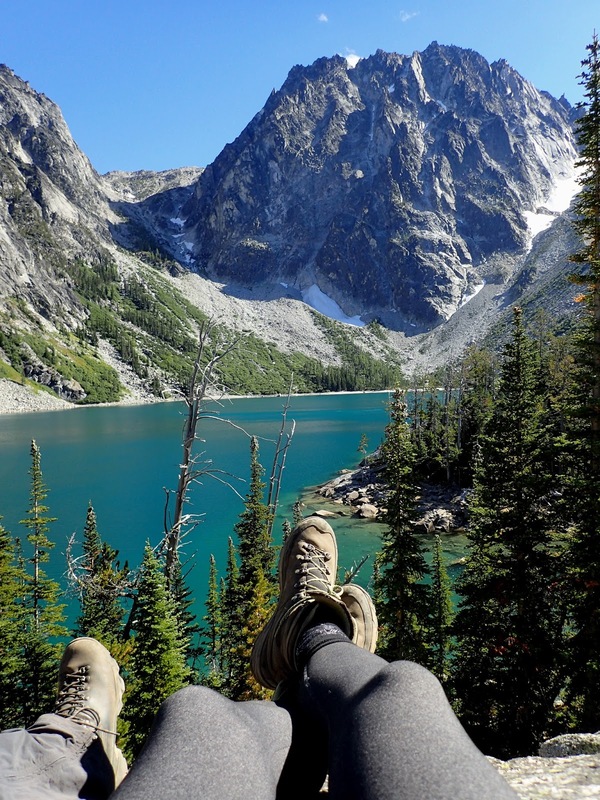 Our boots enjoying the view at Colchuck Lake. Leavenworth is also the gateway to the Enchantments, an alpine paradise dotted with deep blue lakes and rugged granite peaks. It's such a paradise that overnight permits are required via lottery. Thru-hiking is an option, but you'll gain a minimum of 4,000 vertical feet over seven miles just to get to one of the upper lakes. The point-to-point route is around 18 miles. 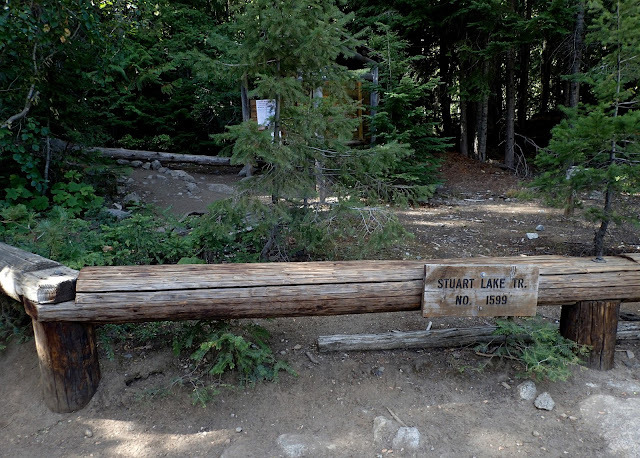 After spending our last night in Twisp, we opted for the scenic three hour route to the Stuart Lake Trailhead. Our drive took us south, then slightly west toward the southeastern end of Lake Chelan. The terrain looked desert-like, a stark contrast to the wet, green woods we'd seen on the western slopes of the Cascades. After passing through Leavenworth, we turned on to Icicle Road, following it to Icicle Creek Road. The last few miles of the road were dirt and gravel, bumpy, and narrow, but nothing compared to the road up to Hart's Pass we'd taken the previous day. The parking lot has room for three dozen cars by my estimation, but it was almost full when we arrived around noon. We grabbed day use permits, which all day hikers are required to carry, and set off around 1pm. Our day hike to the lake covered around eight miles and 2,300 vertical feet. 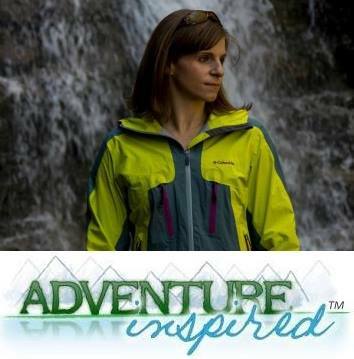 Beginning from the parking lot, the trail climbs gradually through deep, dense forest along Mountaineer Creek. The trees kept the landscape out of sight, but the forest thinned the further along the trail we got, and we could hear and occasionally see the creek for the first mile and a half. Our legs warming up slowly, we came to a giant log bridge and paused to take a look at the creek rushing beneath our feet. Across the bridge, the trail steepened and became rockier, which I'd read was a small taste of what we could expect on the rest of the hike. We'd already seen a dozen or so others, but given Colchuck Lake's reputation, and the accessibility of the trail's namesake, Stuart Lake, I was surprised we hadn't seen more. Another 3/4 mile along the trail brought us to a junction, at which point we chose to turn left and continued on to Colchuck Lake rather than following the trail to Stuart Lake. Shortly after, we came to another Mountaineer Creek crossing over a solid, sturdy bridge, but the water ran much faster here. The bridge crossed into a giant boulder field and as we picked our way through it, the creek flattened, giving us the last stretch of moderate trail before we started climbing again. At this point, the switchbacks began, and we ascended out of the valley with intermittent views of the landscape around us. I hadn't brought a map along, knowing the trail would be crowded and easy to follow, and kept myself busy trying to guess which mountain was which and where the lake was based on trip reports and photos I'd seen. We continued to climb, and as soon as I started thinking, "it can't be much further than this, we've been climbing forever," the trail flattened and I could see Colchuck Lake's beautiful aquamarine water through gaps in the trees. Shortly after, an unobstructed view of the lake, rugged, jagged Dragontail Peak, Aasgard Pass, and the lower slopes of Colchuck Peak were our reward for the climb. Overnight backpackers we'd stayed in close proximity to continued on toward Aasgard Pass to look for campsites. 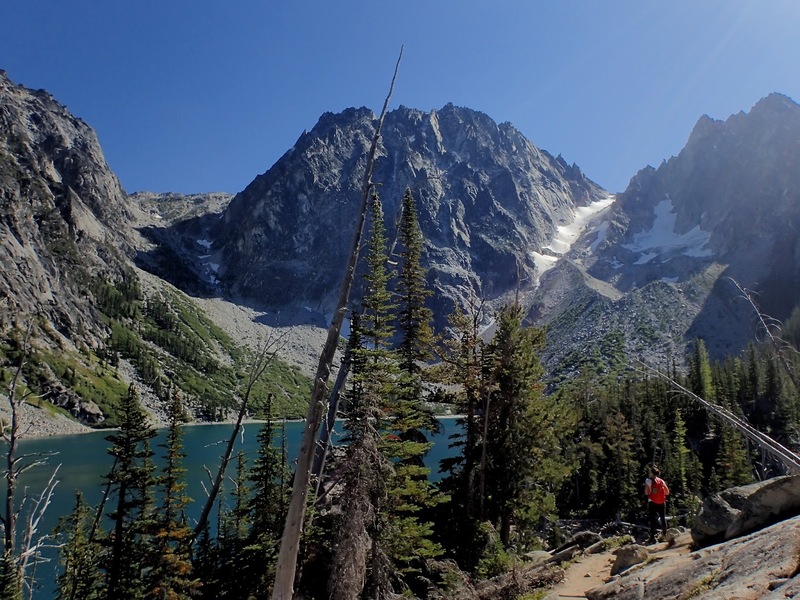 Hikers can continue on around the lake to the bottom of what's left of the Colchuck Glacier, up and over Aasgard Pass, and beyond into the Enchantments, or stop for lunch at the lake, as we did. A pair laden with multiple ropes came up behind us while we munched on leftovers from East 20 Pizza (oh so very highly recommended) and told us they planned to use the lake as a base camp for a handful of multi-pitch climbs in the area. From where we sat, Aasgard Pass looked impossible to walk up, but part of me wished we'd left earlier in the day so we could make the journey up there and back to the car before dark. Without enough time and a drive to Issaquah planned that evening, we finished our pizza, fending off extremely bold chipmunks who'd clearly become accustomed to humans as food sources (ughh), turned around, and headed back down. Given the area's popularity, precious natural resources and trails are subject to an incredible amount of human impact. Colchuck Lake and the Enchantments are part of the Alpine Lakes Wilderness, and both overnight and day use permits are required. We picked up day use pemits right at the trailhead, but getting permits for overnight stays is really, really hard. They're required from May 15th to October 31st, which is six weeks longer than the permitting season during previous years, and hikers have to enter a lottery to try for one. 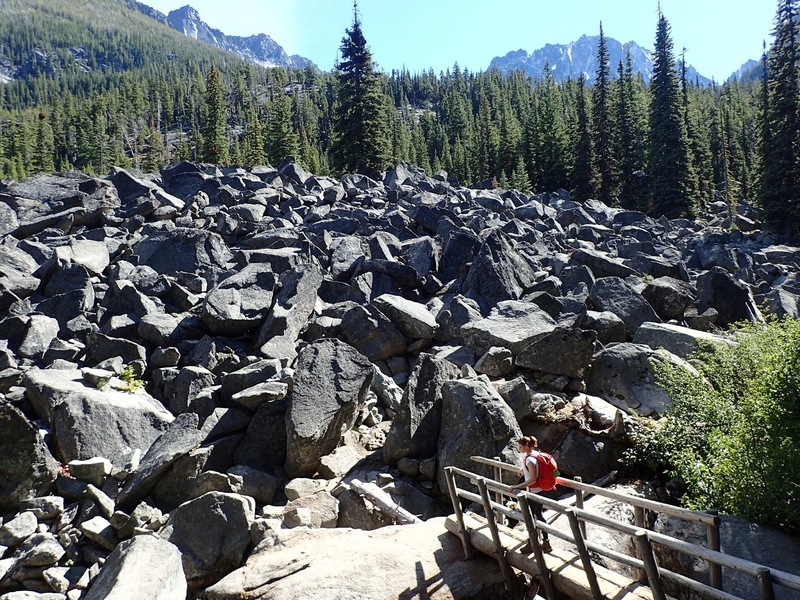 Day hiking the entire Enchantments route is an option, but I've heard convincing arguments about how that defeats area resource management goals. Regardless, if you're doing this hike, help with resource management by using the pit toilet in the parking lot before you head out. Keeping food away from wildlife is paramount, as it is everywhere, but it's clear the wildlife around Colchuck Lake knew what our presence could mean. The chipmunks we met walked right up to me begging for a piece of our pizza, and leaving any food exposed sentenced it to a quick disappearance. As was the case with other hikes we looked at, wta.org provided more than enough information to get us where we needed to go. 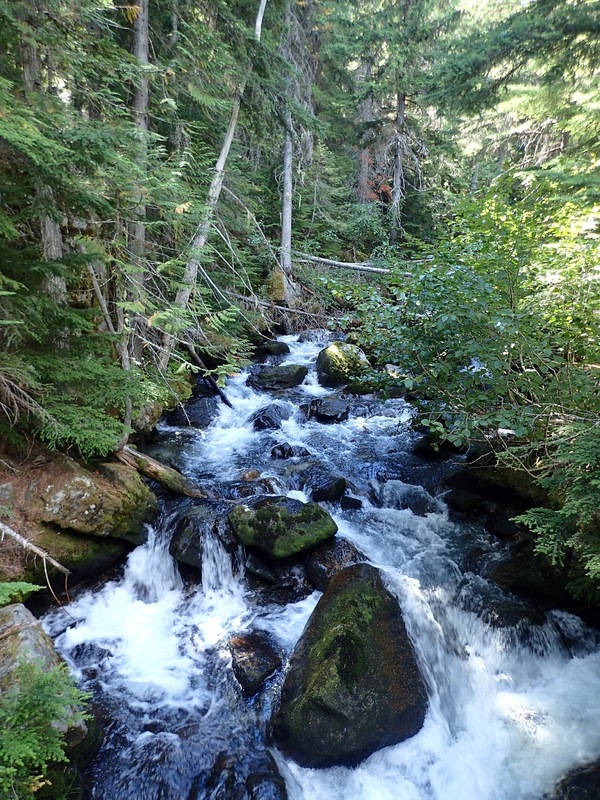 The stretch between Icicle Creek Road and the trailhead is typically only from May to November, making the hiking season very short. Rumor has it the parking lot is packed early in the morning and cars spill on to the road itself, so plan accordingly. We got lucky showing up around lunchtime on a weekday. Have you been to Colchuck Lake, and/or the Enchantments? What do you think about the idea of day hiking the entire 18-20 mile route in lieu of successfully getting an overnight permit? Truth be told, I'd love to do it, but if the purpose of the permit process is to protect natural resources, I can see arguments against it. Would love to hear your thoughts in the comments!